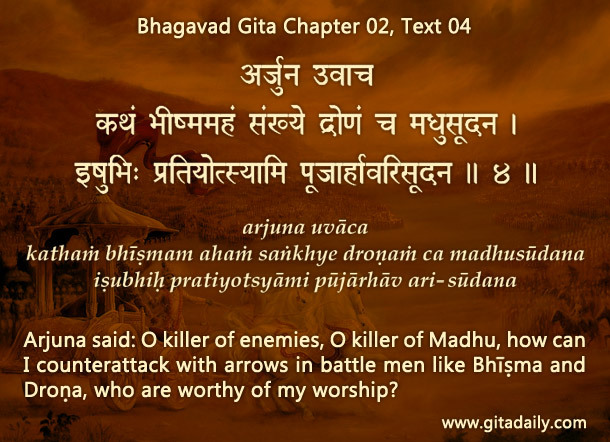 Similar was Arjuna’s protest to Krishna in the Bhagavad-gita. Agonized at the prospect of fighting against his own relatives, Arjuna cast aside his bow (01.46). When Krishna exhorted him to fight, he protested strongly, arguing that he couldn’t shoot arrows at elders who were worthy of his veneration (02.04) Despite this protest, he soon surrendered to Krishna, praying for guidance (02.07). What changed his disposition from protest to prayer? Humility. Humility means acknowledging that God, in his infinite wisdom, always has a plan, and we, with our finite intelligence, don’t always have access to that plan. As Arjuna had lived a life of dharma and devotion, all those spiritual impressions came to his rescue amidst his confusion – they prompted him to stop protesting and start praying. Similarly, when faced with obstacles, we need to change our driving question from “Why is this happening?” to “How can I move ahead now?” To make this change, we need humility. How can we develop such humility? By studying the Gita, practicing bhakti and enriching our consciousness with spiritual impressions. Turning to Krishna will release our mental energy from being choked by resentment. Being freed to think more clearly, we will become more receptive to Krishna’s guidance, from within or without or both. With our intelligence thus divinely equipped, we will find an effective way through obstacles.